Gun owners’ patience and persistence was rewarded on Saturday and yesterday, as the Texas House of Representatives led by Speaker Joe Straus (R-San Antonio) gave approval to a wide range of pro-gun legislation while the NRA Annual Meeting was underway in Houston. Most of these bills passed overwhelmingly, in spite of repeated attempts by anti-gun members of the minority party to kill some of these measures by raising parliamentary “points of order” against them for alleged violations of House rules. Many violations are procedural in nature, involving the committee process and committee reports. Thanks to the meticulous work of House Homeland Security and Public Safety Committee Chairman Joe Pickett (D-El Paso) and his staff, none of the points were sustained, and debate and votes on the bills were allowed to proceed on the House floor. Senate Bill 299 / House Bill 1304 by state Senator Craig Estes (R-Wichita Falls) and state Representative Kenneth Sheets (R-Dallas) protects against charges of unlawful carry for the inadvertent or accidental display of a handgun by a Concealed Handgun Licensee. SB 299 was taken up in lieu of HB 1304 on the House floor and will be the bill that goes to Governor Perry for his signature. Senate Bill 864 / House Bill 47 by state Senator Donna Campbell (R-New Braunfels) and state Representative Dan Flynn (R-Van) reduces the minimum number of required classroom training hours for original and renewal Concealed Handgun Licenses from 10-15 to 4-6. This change would make it far more convenient for CHL applicants to obtain a license to carry and exercise their right to self-defense. SB 864 was taken up in lieu of HB 47 on the House floor and will be the bill that goes to Governor Rick Perry for his signature. House Bill 508 by state Representative Ryan Guillen (D-Rio Grande City) imposes civil fines on state agencies, cities or counties which improperly post 30.06 signs prohibiting Concealed Handgun Licensees from property which is not off-limits to them under the Texas Penal Code. It also gives the Texas Attorney General or local district attorney the ability to sue to collect the civil penalties if the offending agency or political subdivision fails to remove the sign after having been notified of a violation. This bill now moves to the Senate for consideration – please contact your state Senator and urge him or her to support HB 508! Contact information can be found by clicking here. House Bill 972 by state Representative Allen Fletcher (R-Cypress) and state Senator Brian Birdwell (R-Granbury) eliminates the criminal prohibition on the possession of firearms on public and private college campuses for Texas Concealed Handgun Licensees. As passed in the House, schools may adopt administrative rules and regulations restricting licensees in campus buildings, but only after consulting annually with campus law enforcement, faculty, staff and students. HB 972 also now contains language from SB 1907 by Senator Glenn Hegar prohibiting public and private institutions of higher education from adopting or enforcing policies banning students who are CHLs from transporting and storing handguns and ammunition in their privately-owned motor vehicles while driving through or parking on campus. This bill now moves to the Senate for consideration – please contact your state Senator and urge him or her to support HB 972! Contact information can be found by clicking here. House Bill 48 by state Representative Dan Flynn (R-Canton) and Senator Donna Campbell (R-San Antonio) streamlines the process for renewal of a Concealed Handgun License by eliminating the continuing education course and handgun proficiency demonstration requirements. Applicants would still be required to renew their licenses every five years, but they would be provided with an informational form regarding pertinent firearms and deadly force laws, which would have to be signed and turned in with the CHL renewal application. House Bill 485 by state Representative Sarah Davis (R-Houston) reduces the fees for original or renewal Concealed Handgun Licenses charged to veterans who are honorably discharged after at least one year of military service, as well as reserve and part-time peace officers, to $25 – from $70 to $35, respectively. 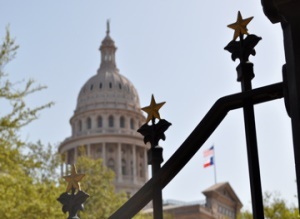 A House floor amendment was adopted which included two new categories of individuals to whom this new discount would apply: TDCJ correctional officers and members of the Texas Military Forces. House Bill 698 by state Representative Drew Springer (R-Muenster) and state Senator Craig Estes (R-Wichita Falls) requires DPS to establish procedures for the submission of fingerprints by CHL applicants who live in counties with populations of less than 46,000 and do not live within 25 miles of a designated facility capable of processing them digitally or electronically. Availability of such services continues to be a problem in rural areas, as the state only contracts with one company. House Bill 1349 by state Representative Lyle Larson (R-San Antonio) prohibits DPS from requesting or requiring that an applicant’s social security number be disclosed during the process of obtaining an original or renewal Concealed Handgun License. House Bill 1421 by state Representative Charles Perry (R-Lubbock) and SenatorCraig Estes (R-Wichita Falls) would allow firearms seized by law enforcement in connection with a crime, and not returnable to a rightful owner, to be sold at a public sale to federal firearms licensed dealers rather than be destroyed.